Arachnophobes look away now – a gruesome Halloween surprise came a week early in one Aussie household when a giant Huntsman spider was caught on camera trying to devour a luckless mouse. 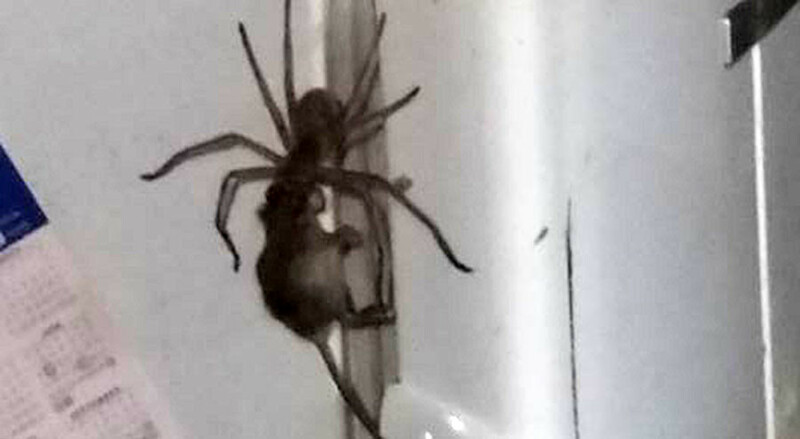 The skin-crawling footage was filmed at a residence in Queensland, northeast Australia, and has so far gained 7 million views online – not to mention more than a few horrified comments. Australia is home to many of the world’s most deadly arachnids and, while the huntsman is generally harmless towards humans, the same cannot be said for pests like mice. In the 19-second clip, filmed on a camera phone, the large creepy crawly shows incredible strength by locking onto the mouse’s head and pulling it up the side of a household fridge. The video was posted to Facebook on Sunday by Jason Womal, who captured the circle of life moment at his neighbor’s house. “So I am just about to leave for work and my neighbor says ‘You want to see something cool?’ So we proceed to his place and he shows me this – Huntsman trying to eat a mouse,” Womal explained on Facebook. The mouse’s gruesome fate is not shown in the clip, but Womal says the spider is fine and has been given the adopted name ‘Hermie’. “He is now running his own extermination business out of our town Coppabella. Oh and he is now paying rent,” Womal joked online. Unsurprisingly, the clip has many people expressing their fear of spiders. “Thanks for that. Now I’m not going to sleep from thinking about it,” another Facebook user added. “This is why I’m never visiting that cursed continent,” a third person posted.